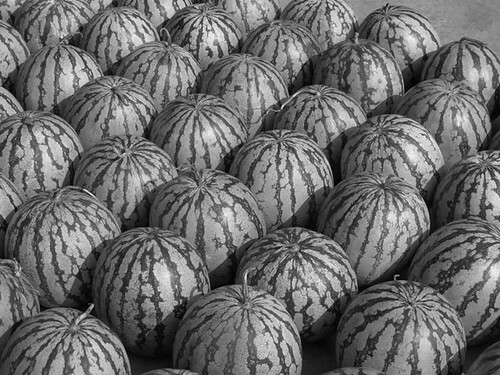 I was more impressed with the B&W shot of these melons than I was of the shot of the melons in color. Not sure if they look more appetizing - but they look more artistic. I think you are right. In B&W you look at the pattern - colour distracts. You do notice lines and shapes more in black and white and use you imagination more. Perfect choice for MM. What great lines. I bet they taste as yummy as they look on this shot! They are more artistic. Who knew that about watermelons? lovely the gradation of light..